Socio-Political-Journal... : Why Does The LEFT Get A Pass On Anti-Semitism? Democrats are ignoring -- and worse, rationalizing -- the bigotry in their midst. The other, perhaps more pertinent, factor driving the kind of leftist anti-Semitism we see on campuses across America and now gradually in politics is anti-Zionism. That’s because it is not merely criticism of various Likud policies that girds this animosity, but a broad antipathy towards the very existence of the Jewish state — a position that almost always devolves into something uglier. 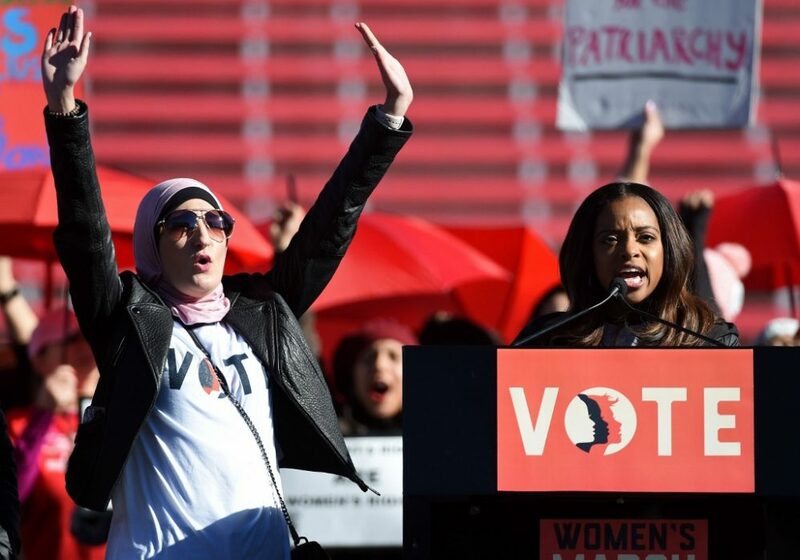 The most obvious example of this trend is the Left’s embrace of Women’s March co-founders Tamika Mallory and Linda Sarsour, both supporters of the anti-Semitic Nation of Islam (although Sarsour’s Jewish problem goes deeper). Mallory only recently attended a speech given by Louis Farrakhan and posed with a man who had that day opined on “Satanic Jews” and other pressing matters. Referring to Farrakhan as “GOAT” — the greatest of all time — Mallory will surely continue to widespread attention and adulation in mainstream publications. Jarrett’s contention that the Koch brothers, whose consistent libertarian positions make it entirely predictable that they’d be concerned about criminal justice issues, are comparable to a man who described Hitler as “a very great man” is half a despicable smear and half a clumsy attempt to moderate the real extremism within her own ranks. Of course it’s inconvenient, perhaps even politically perilous, for Democrats like Jarrett to attack their own Resistance leaders. Perhaps they even have some ideological sympathy for the cause. Moreover, acknowledging that both sides attract bigots undermines a critical narrative for Democrats. This is why places like the Anti-Defamation League spend an inordinate amount of time acting as if some fringe Nazis, most of whom probably live in vans down by the river, are a cohesive and dangerous movement while largely ignoring, or quickly moving past, leftist anti-Semitism. It’s also why Richard Spencer and David Duke, people with few followers and zero political power, are given an inordinate amount of media attention while the fact that Congressional Black Caucus members, who both coordinated and met with the leader of the Nation of Islam, is given virtually no coverage at all. It’s why the deputy Washington editor of The New York Times, Jonathan Weisman, can write an entire fearmongering book purporting to examine Jewish life in “the Age of Trump” by stringing together a bunch of disparate incidents — some genuinely troubling, others imagined — to warn of the coming fascism, while meticulously ignoring the contagious strains of anti-Semitism that live, not on the periphery, but smack in the middle of the most celebrated activist movement in the country. In Britain, there has been something of a reckoning for Labour Party leader Jeremy Corbyn, who has spent a lifetime associating and befriending Jew-haters, 9-11 Truthers, terrorist sympathizers, Holocaust deniers, and politicians who claim Jews perpetrate blood libel. In the United States, these kinds of associations with the far-left would have previously destroyed careers. Not anymore.